1. WHAT IS IT? A debtor may wish to pay a debt in order to keep an asset, even though that debt would otherwise be discharged in bankruptcy. For example, a debtor may wish to keep a vehicle. As a promise to pay that debt, a debtor must enter into a Reaffirmation Agreement with the creditor. Reaffirmations are voluntary, are not required by law, and the debtor will remain liable on the debt after the bankruptcy. It is recommended that the debtor carefully consider whether or not the agreed upon payments can be made before entering into a reaffirmation agreement. 2. WHEN MUST IT BE FILED? Any agreement to reaffirm must be made before the discharge is entered. If you are in the process of reaffirming a debt and feel it will not be filed before the discharge deadline, notify the clerk’s office in writing to delay entry of the discharge until the reaffirmation is filed. 3. AM I REQUIRED TO FILE ONE? Reaffirmations are strictly voluntary. If you wish to reaffirm (agree to pay back after bankruptcy) any particular debt, you must enter into a written agreement with the creditor, which legally obligates you to pay all or a portion of a dischargeable (wiped out by the bankruptcy) debt, using either Form B2400A Reaffirmation Agreement or, if Pro Se (without counsel) Form B2400A/B ALT Reaffirmation Agreement Alternate. Both the creditor and debtor must fully complete the entire form indicating the nature of the debt, the value of the collateral, and the reason for reaffirmation. Both parties to the reaffirmation must sign on the appropriate signature lines. 4. IF REAFFIRMING A DEBT WITHOUT COUNSEL: If you are not represented by an attorney, the reaffirmation will be automatically set for hearing and you will receive written notice of the hearing date and time. You must appear at the hearing where the bankruptcy judge will determine if the reaffirmation of the debt is in your best interest, based on your circumstances, your ability to re-pay and the nature of the debt sought to be reaffirmed. For example, the court may not allow you to reaffirm a debt of $3,000 for a vehicle that worth $1,000. 5. WHAT HAPPENS IF I REAFFIRM AND DEFAULT? If a debtor reaffirms a debt and fails to pay it, the debt remains owed as though there were no bankruptcy and the creditor can take action to collect the debt. This reaffirmed debt is not discharged or wiped out by the bankruptcy filing. 6. DOES THE COURT HAVE TO APPROVE THE REAFFIRMATION AGREEMENT? The Court is not required to approve a reaffirmation for a consumer debt secured by real estate. This applies to any mortgage(s) on your home or other debts secured by your home. In addition, the Court does not approve any reaffirmation agreements between debtors and credit unions. They are filed and become part of the record without a hearing. 7. RESCISSION: You have the right to cancel (rescind) any reaffirmation agreement prior to the entry of your discharge or within 60 days after the reaffirmation agreement is filed with the Court, whichever occurs later. 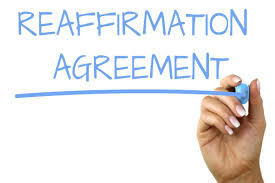 To rescind a reaffirmation agreement, you must timely mail a written notice to the creditor stating that you are withdrawing your decision to reaffirm and revoking the agreement. Send the original letter to the creditor and a copy to the Clerk’s office to be made a part of your case file. The debtor and/or creditor fails to sign any of the required parts of the agreement. A Reaffirmation Agreement will be considered defective if Part E is not completed. Failure to submit a completed Part E within the deficiency period (14 days) will result in the agreement being stricken from the docket and unenforceable.